Stainless steel pots in a versatile range of sizes, a stockpot, two skillets and a saute pan--all with nonstick linings and perks you won't notice until you use them--make this Cuisinart Classic Chef's cookware assortment invaluable. What you can't see adds to energy efficiency and overall value. Pot and pan bases incorporate an inner layer of aluminum for fast and even heat distribution. You'll need less energy to cook with, if you use this set. Food cooks faster at lower temperature settings--in fact, low to medium settings are recommended. 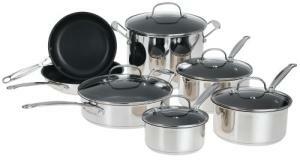 The nonstick lining of these pots and pans allows cooking with less oil. I use both lined and unlined saute pans and have noticed that nonstick pans need about half the cooking oil--over a year, that's a lot of calories saved. With the heavier construction of this set, you get the best of both worlds, saving both energy and calories. The 12 piece set includes break resistant glass lids and is oven safe to 500 degrees. Capacities and types include all the basics needed to equip a new kitchen. Cuisinart offers a limited lifetime warranty on the set, but be sure to use only wooden or plastic utensils for stirring pots or when turning food in the pans. The entire set is dishwasher safe, but for best care wash and dry by hand.